On the other hand, every database administrator or the person whose responsibility for managing SQL Server; needs to have some knowledge about SQL Server Agent. So that the database administrator can execute, schedule and automatize essential database maintenance operations through SQL Server Agent. In terms of essential database maintenance methodology, these operations should be done properly and regularly to avoid catastrophic failure. Such as; taking database backups or indexing are the regular database maintenance operations that can be automatized with help of SQL Server Agent. Regarding this idea, SQL Server Agent is the significant assistant tool for a database administrator. Job Steps and Schedules are an integral part of SQL Agent jobs. A Job step can be defined as task or group of tasks which will be completed by SQL Agent, in addition to when we want to set up a job at least we need to do one job step. When we look at the output of the job step, it can report two results after the completed task. These are successful or failure. Schedules specify when a job will run. So far, we mentioned about SQL Server Agent and the main component definitions and why we need SQL Server Agent. Now, we will talk about the main idea of this article. This article will cover how to alert or notify database administrator when a job reports a failure. If we are notified about SQL Agent job fails, we can handle the issue as soon as possible and prevent the problem without causing the further problems. When we look at this aspect that we need a job fail notification system. We can use SQL Server built-in functions such as database mail or SQL Agent mail, but this solution will not be effective and will not give many details about job steps errors. So, we will overcome this problem with help SQL Server Reporting Service email subscription. Also, we don t need to write some custom html codes to get well formatted emails. Now we will create a job with the following query. The created job named is DemoJob and scheduled to run every 10 minutes. Through this SQL Agent job, we can create error for every 10 minutes for our demonstration. 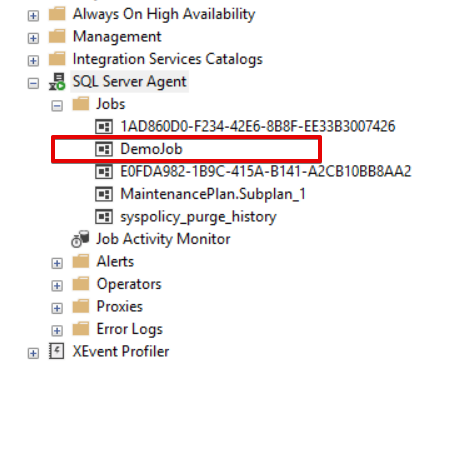 After the demonstration drop the DemoJob because it will create unnecessary errors. After the creation of DemoJob you can see that under the folder. Note: In this tip, we will use Ed Pollack job alerting procedure who discuss details Reporting and alerting on job failure in SQL Server in this article. This stored procedure logs job steps errors, but we will make some little modifications and adopted this stored procedure for SSRS usage and then we will use it. The following stored procedure will help us to get error logs of SQL Server Agent. -- First, collect list of SQL Server agent jobs and update ours as needed. -- Update our jobs data with any changes since the last update time. -- If a job was deleted, then mark it as no longer enabled. -- Find all recent job failures and log them in the target log table. -- Get jobs that failed due to failed steps. -- Get jobs that failed without any failed steps. -- Get job steps that failed, but for jobs that succeeded. After all these preparation steps about SQL Server Agent, we need to configure SQL Server Reporting Service email settings. In this step, we will schedule to subscription for every five minutes, because in the procedure we set the looking parameter to five minutes 1440 second. If you want, you can change this schedule setting, but you need to make the same changing in the procedure. In this article, we created a mail notification for SQL Server Agent failed jobs. We used a stored procedure which helps to log detail error of job steps. Through the SQL Server Reporting Service subscription, we created an email notification. The benefit of this approach is that we don’t need any email settings in SQL Server or SQL Server Agent.